Little Muffin the Stuffed Puffin Mini Flopsie by Aurora is ready to butter you up! 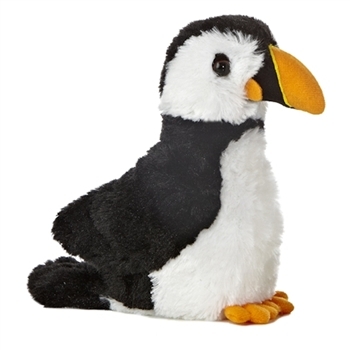 Measuring eight inches, this small puffin stuffed animal has soft, fuzzy black and white plush fur with little black eyes and a cute little puffin tail. Our little plush puffin sports the signature yellow puffin beak and has yellow feet to boot! Pun intended! The seven inch size and affordable price of this small stuffed puffin make it perfect for party favors, gift bags, school events, and any other occasion that calls for an adorable little hand out! A member of the Aurora Mini Flopsie family, Little Muffin the Stuffed Puffin is made from high quality child safe materials and meets or exceeds all U.S. safety standards. Recommended for ages three and up, our little plush puffin is surface washable. My son is loving all the (many) Stuffed Safari items he's picked out so far, and I have nothing but positive feedback as to the quality of the products. There is virtually a zoo already and I don't want to write the same review over and over; that's precisely what would happen because I have no negative issues - and more importantly, neither does my son. I chose to review this particular Little Muffin since it has to be one of the most darling little thing I've seen, and I've seen A LOT !! I'd absolutely recommend these products to anyone (actually, I already do). They score virtually perfect on every level - quality, price, shipping (cost, speed, packaging), customer service. I love this company and their products - again & more importantly, so does my 7 year old son Lynkin. Muffin the Puffin was a special gift for a very nice lady who has done a lot of wonderful things for me. I am a handicapped person and it is not always easy for me to get things done. This lady stops by and helps get things done because my Joyce works during the day. She always wanted a Puffin and I was most happy to be able to once again work with Adrian who makes great bandanas and it was a pleasure to speak with Troy about Stuffed Safari Co. and how well I thought it was run.